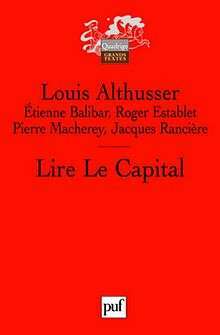 Reading Capital (French: Lire le Capital) is a 1965 work of Marxist philosophy by Louis Althusser, Étienne Balibar, Roger Establet, Jacques Rancière, and Pierre Macherey. An abridged English translation was published in 1970, and an unabridged translation in 2016. 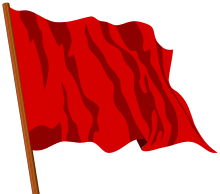 Althusser and his co-writers attempt to analyse Marx's Capital: Critique of Political Economy in a scientific manner, and give an account of its underlying philosophy. The book caused a sensation in French intellectual circles, and attracted a large international readership. The abridged English translation, which includes only Althusser and Balibar's contributions, was published in 1970, and helped shape the development of Marxist thought in the English-speaking world throughout the 1970s. A complete English translation, which restores chapters by Roger Establet, Pierre Macherey and Jacques Rancière, was published by Verso Books in July 2016. ↑ McLellan, David (1995). 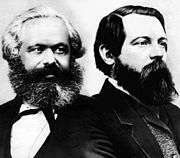 The Thought of Karl Marx: An Introduction. London: Papermac. p. 264. ISBN 0-333-63948-0. 1 2 Levine, Andrew (1999). Audi, Robert, ed. 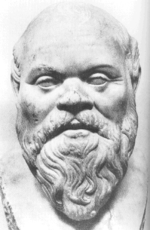 The Cambridge Dictionary of Philosophy. Cambridge: Cambridge University Press. p. 23. ISBN 0-521-63722-8. ↑ Scruton, Roger (1985). Thinkers of the New Left. Harlow: Longman Group Limited. p. 218. ISBN 0-582-90273-8.